Welcome to the 360° immersive cinema experience at Domeville’s Dome, where everyone has the best seat in the house! Located in SoFlo (Southern Florida), Domeville’s Dome projects the magic of 4K high definition and 360° images, lighting up night skies and drawing crowds from miles around. 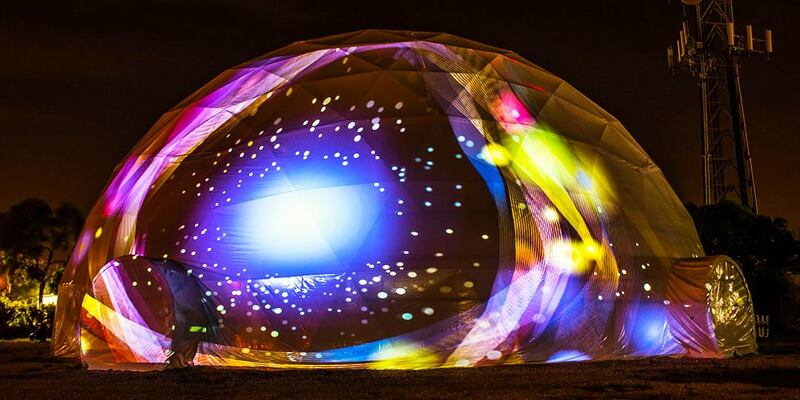 The iconic 70’ geodesic dome has become the nightclub hub of the Wynwood Arts District nightlife. With its full-dome visualization theater, Domeville’s Dome is now available for Corporate and Private Events. The free-standing Event Dome has the capacity to comfortably seat 500 people in an air-conditioned environment. 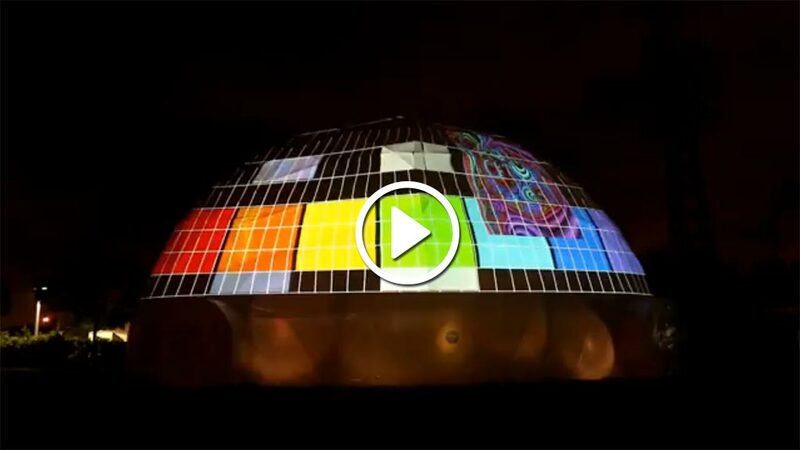 Domeville’s Dome draws their audience into the exciting world of projection mapping with visualization effects, presentations, educational films and interactive logos for brand imaging, as well as interactive games for the Event Gaming Industry. You are only limited by your imagination to create a truly unique space for your event venue. With the magic of 360° immersive cinema projection mapping, you’ll find up to 6 times better imaging then traditional projections, synchronized with incredible sound effects. Whether your project is simple or extravagant, your ideas can be brought to life and transformed into a 360° immersive cinema experience with Full Video Mapping Services. The future of immersive-interactive entertainment and education is here with the magic of 360° Projection Mapping. It’s an exciting new projection technique that turns almost any surface into a dynamic video display. Specially designed software wraps and masks the projected image to perfectly align with any surface, no matter the shape. The end result is a picture-perfect projection that transcends ordinary video projection. Hurricane Proof? Did Domeville’s Dome Survive Hurricane Irma? Yes, Domeville’s most structurally unconventional venue went unscathed during the worst hurricane to ever hit Miami in recorded history. While the rest of Miami hurricane-proofed windows, the geodesic structure withstood Irma’s punishing wind and water. There are continuous reports of the geodesic dome being the only structure left standing after a hurricane. 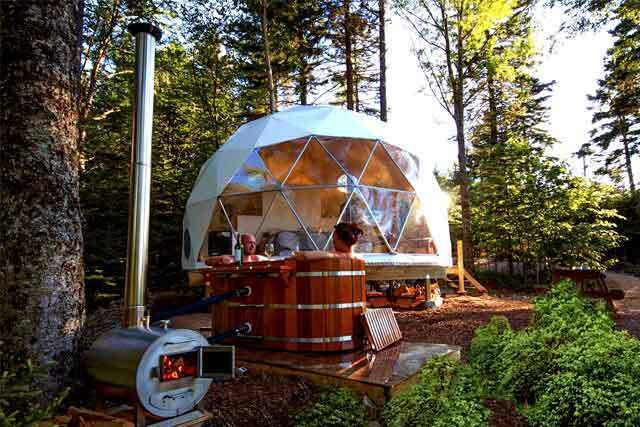 As hurricanes continue to devastate many coastal communities, Pacific Domes encourages the world to think ‘geodesic dome,’ the strongest structure known to man… aerodynamic and hurricane proof! Plus, it’s a great place to experience immersive cinema! Next Post:Make a Geodesic Gingerbread Dome for the Holidays!